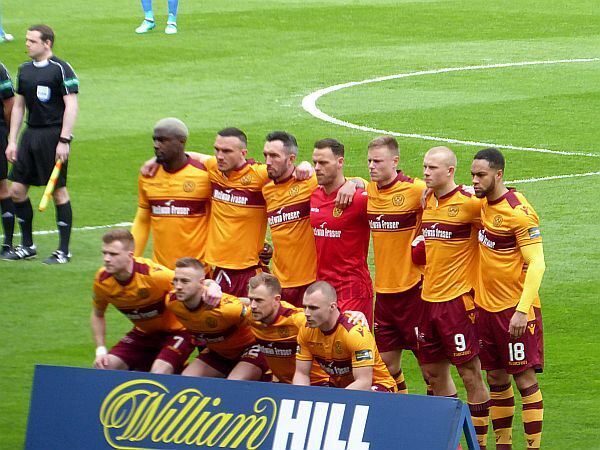 It is one thing to be known as a cup team but Motherwell needlessly reinforced that image by not winning between the quarter and semi-finals. Indeed we scored only twice in that time, once from a penalty, so we did not rock up to Hampden full of confidence. Carl McHugh, hero of the last round, was suspended and a handful of injuries reduced our options further. But Aberdeen were without midfield duo Kenny McLean and Graeme Shinnie, Shay Logan was also banned and neither Gary Mackay-Steven or Niall McGinn were fit enough to start. Even so, logic dictated in a battle of squad depth we would come out second best and that was ignoring the feeling another cup thrashing of Aberdeen, as in the League Cup quarter, just did not seem on. Such thinking proved gleefully overwrought. Instead, Motherwell played like Motherwell and Aberdeen played like Aberdeen (in the cup) – and in those circumstances there would only be one winner. Derek McInnes had led his side to a 2-0 win at Fir Park just 11 days before but reading the Aberdeen messageboard between his line-up being announced and winning was revealing. The Dons fans were angry at a perceived negative selection seemingly designed to counteract our strengths rather than promote their own – surely a mistake when you have, according to the table, fundamentally better players. The obvious belief is he was still scarred from the League Cup beating in October when we literally chased his team all over Fir Park. Whatever. Aberdeen made the better start but they were playing our game – long balls, headers – and it couldn't last. We gradually imposed ourselves on proceedings and had a massive break when Richard Tait's handball was missed and he set-up Curtis Main for another tap-in. Moments later the game was effectively done when we scored the most Motherwell-like goal of the season. A long throw into the box was cleared to the halfway line, headed back, headed on, sliced up in the air, volleyed by Ryan Bowman and fumbled by Joe Lewis straight back to him. Bowman connected again (on the volley) and when the ball dribbled into the net it felt its first contact with the ground in 11 (eleven!) seconds. The ball – surely by now wondering what it had done to be victim of such an occasion – had been propelled from 18-yardline to halfway and back to the edge of the Aberdeen six-yard box. We had scored courtesy of three mistakes (Scott McKenna and Kai Arnason prior to Lewis) in the space of nothing at all from the flimsiest of pressure. Our only danger was ourselves and it's worth admitting we offered Aberdeen chances to get back into the game. Cedric Kipré and Charles Dunne both made errors it is impossible to think Celtic wouldn't punish but Aberdeen let us off and Main's brilliant solo goal (from an error, obviously) put the icing on the second half cake. We had a day to await our opponents which everyone – save a few deluded fools at Ibrox – knew would be Celtic. The final score was four and it could have been more. But we watched the highlights with interest as the Celtic defence looked less than secure. If we are to have any hope of a May 19 upset, we cannot afford to pass up such gift-wrapped opportunities.